If you are looking for themes which are responsive and you could easily customize them according to your needs then SKT Themes has covered you. We have more than a hundred themes in our portfolio and all of them are responsive because we have tested each one of them on every platform available like smartphones, PC, tablets, etc. All of our responsive themes are easily customizable themes. We provide documentation with all our free WP themes so that you if you ever face any problem in the installation or customization process you could use that documentation to help yourself out. 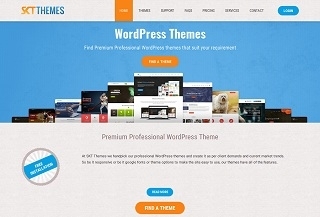 All our premium themes come with one-year full assistance and you can contact anytime in that period regarding any issue. Technical support has always been so helpful! I really appreciate all the effort the SKT team put into helping me get the website just the way I want it! We are very happy to work with SKT Themes! Thanks for the support. The team here at SKT Themes have been extremely helpful with all my queries and have responded quickly get things sorted &ndash; my last query was quite complex and it required a long conversation to get resolved. They provided great help and support &ndash; thank you.